Shelley Bean: Made it Myself Monday! Hi there! I thought I would participate in the Made it Myself Mondays Challenge. Over the weekend I was inspired to try my hand at crocheting some dishcloths. Previously, I wasn't a big fan of the concept (not sure why) until I had to handwash some dishes at my mother's home and discovered these things are quite clever and very durable! The secret (from what I can tell) is to use cotton yarn. The acrylic yarn would be all fuzzy and icky when it gets wet, but the cotton works great and everything seems to hold together nicely. Here is the one I made. It's not perfect. I need to tweak it a little and do better stitch counting, but it only took me about 40 minutes to whip up. The instructions can be found HERE. 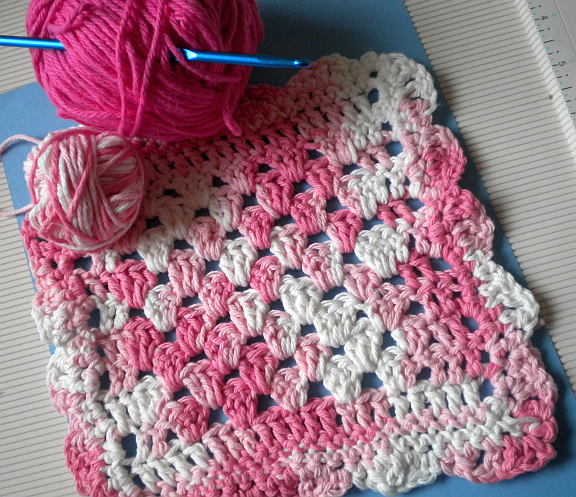 If you are familiar with crochet there are tons of different patterns out there. Pretty much anything that would have made a cute granny square would work I would imagine. And yep, I made it myself! Hi Shelley! Thanks for leaving your sweet comment on my blog! Your blog has been in my "favorites bar" since last year and I realized that it was silly that I'm not one of your followers yet. Lol, I've added you now and you're STILL on my favorites bar which means your blog is pretty darn special. :D Thanks again! Hi Shelley! I am visiting your blog as part of the Made it Myself Mondays. This is so fun to see other crafty people and their great projects. I want to learn to crochet, so your post intrigued me. Great job! I have to try it soon, although I think I may take a class as I have no idea how to crochet (I can knit a bit though!) Happy Crafting! I simply LOVE this!!! You should sell these. I love anything crochet/knit!! !